One of New Orleans’ water pumps is still not working, just days after the city was flooded with 10 inches of rainfall. With a weekend of thunderstorms in the forecast, the mayor has urged residents to move their vehicles to higher ground. The National Weather Service is predicting “scattered thunderstorms” for the next week. A fire broke out Wednesday night in a turbine that provides power to one of the city’s pumping stations that services the East Bank of New Orleans. The cause of the fire remains unknown and is under investigation. New Orleans officials said that means the system’s capacity to drain storm water from the streets of the low-lying city has been diminished. The city’s mushy soil sinks about two inches per year. The city’s police and fire departments and the Office of Homeland Security were on standby in case rain once again floods city streets. “We hope it doesn’t happen but we’re going to prepare for the worst,” Landrieu said. The loss of the turbine comes as the latest blow to the Sewage and Water Board (S&WB) which came under criticism after it was revealed that pumping capacity was reduced during the floods on Saturday and on July 22. 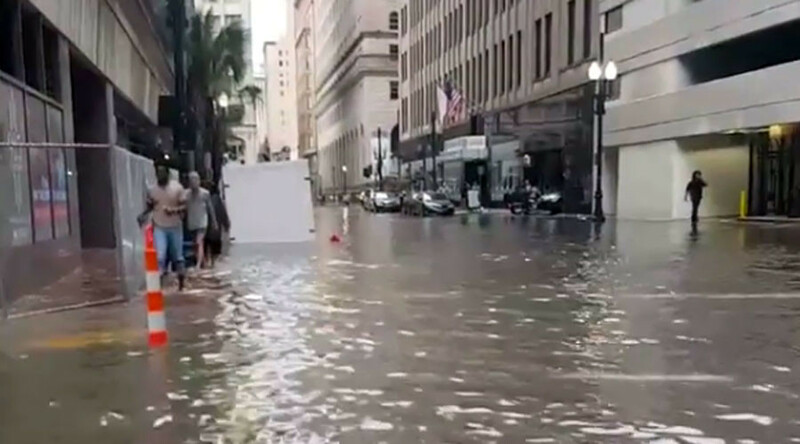 As much as 10 inches of rain fell in just four hours and cut off several areas of the city, with widespread flooding across New Orleans. The mayor’s office called it a 10-year event and one of the highest recorded rainfalls in recent history. The flood overwhelmed the city’s pump system. The waters took 14 hours to drain and prompted 200 “life-threatening” emergency calls, according to city records. Leaders of the Sewerage and Water Board had promised that all 121 drainage pumps were working properly during the storm and said the flooding was caused by too much rain for the system to handle. By Tuesday, however, the board acknowledged that eight pumps were either broken or out of service when the rain began. The board’s executive director Cedric Grant announced his retirement before a special City Council meeting on Tuesday, after which Mayor Landrieu announced he would seek to have general superintendent Joe Beck and communications director Lis Martin fired. Beck and Martin were accused of providing incorrect information to the executive director about the pumping stations. Both have since submitted their resignations. Landrieu had already accepted the resignation of Colonel Mark Jernigan, who headed up the Department of Public Works. A review showed that one of the pumps was running backwards and another pump had caught fire. “I can’t even begin to tell you how frustrated and angry I am at the inability of the S&WB to communicate clearly,” Landrieu told the New Orleans Times-Picayune.